In The Coils Of Copperhead! As a gang of robbers make their getaway in a stolen armoured car laden with bullion, Batman emerges from a manhole in the road ahead of them. They open fire with their weapons as unseen, Copperhead watches from the shadows. The gang drive the truck over the manhole where Batman had stood seconds earlier and they feel a bump, assuming they have driven over a now dead Batman. However, they have merely driven over the manhole cover and unscathed, Batman uses his portable laser to cut the truck in half! The truck, now sliced in two, skids and slams into a nearby wall! A few streets away from where the Caped Crusader is rounding up the dazed robbers, the Mayor of Gotham is welcoming a State Visit by the Queen of England. As she emerges from her limousine and walks up the stairs towards the mayor, a lowly tramp shuffles forward using a walking stick and asks the Queen for some money. Annoyed, the mayor tries to usher him away but the Queen takes pity and hands over a coin. The Tramp however has other ideas and using his stick lifts her tiara from her head before making a swift escape! Before the startled entourage can react he removes his disguise to reveal himself to be Copperhead, before using suckers on his fingertips to clamber up the side of a nearby building. The police open fire but he is already out of range. The villain smiles to himself that everything had gone just as planned, including decoying Batman with the armoured truck robbery. Moments later Batman screeches to a halt in the Batmobile and Commissioner Gordon informs him that he is too late! Copperhead has struck once again by stealing the Queen’s tiara and the Caped Crusader has been caught napping! It is a diplomatic catastrophe! Batman replies that he will capture Copperhead right away and the Commissioner points up the side of the building, indicating that their quarry is already out of their reach. But Batman had other ideas and uses his bat rope to scale up the building. As he climbs up he hears Copperhead’s voice goading him and assumes he is closing in. But as he reaches the top of the roof he finds a tiny playback device in the shape of a snake’s head planted there and realises he has been lured on a wild goose chase! He clambers back down to street level and an angry Commissioner Gordon warns him that Copperhead must be caught at all costs or else they are both in trouble. Batman reminds the Commissioner of all the other felons he has rounded up over the years, but the Commissioner responds that all the mayor and the citizens of Gotham care about is what the authorities have done for them recently. His job – and Batman’s reputation – are on the line because Copperhead has made them both look foolish. Batman nods and says that he will bring the villain to justice no matter what the cost! That night at Wayne Manor, Bruce Wayne muses how Copperhead is the toughest and most baffling foe he has ever faced. If he does not capture him he may as well hang up his cape and cowl for good! The villain always strikes without warning but Bruce asks himself why he should wait until his foe is ready to move again? He needs to make Copperhead strike when Batman wants! Two days later above the skies of Gotham people look up in amazement as Wonder Woman flies through the air using a smoke stick to write a giant message in the sky. It reads “I Love Batman!”. As the citizens of Gotham take in this shocking admission by the Amazon Princess, Batgirl’s plane suddenly zooms into view and she uses a smoke trail to cross out Wonder Woman’s message before writing her own which reads “Only I Love Batman!”. At Police Headquarters, Commissioner Gordon and Batman watch from a window and the police chief asks if Batman knows anything about this spectacle? Batman assures Gordon that he has no idea what this is all about and that this is just the sort of distraction he could do without while trying to track down Copperhead! Not far away on the top of a building Wonder Woman makes a grab as Batgirl’s plane swoops by and rages that she will show the female crime fight not to mess with her words of love. As Batgirl warns Wonder Woman to let go Commissioner Gordon fears the Amazon will kill the vigilante and tells Batman to stop her. 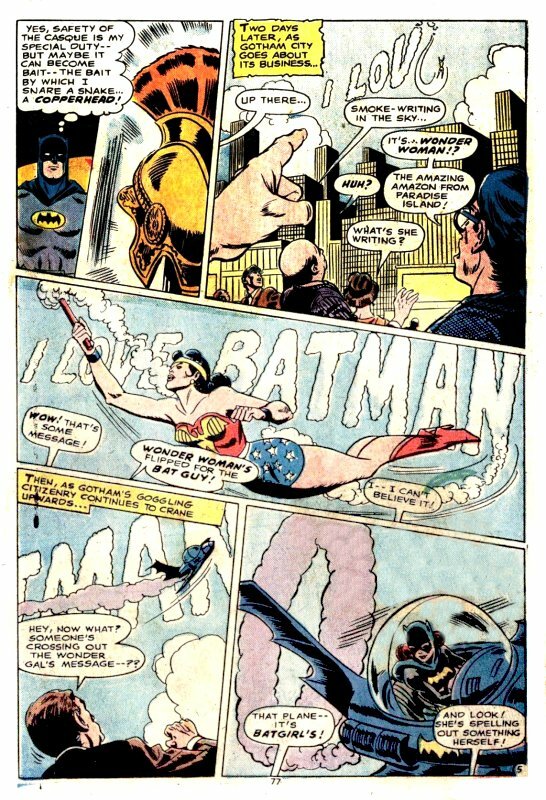 Batman jumps into a gyro copter and races up towards the scuffle, just as Wonder Woman lassos Batgirl’s plane. The two women see Batman simultaneously and arms outstretched, race towards him expressing their love for him! Batgirl leaps from her hovering plane but finds herself suddenly plunging earthwards. Batman immediately swoops to catch her and at the same time grabs the gliding Amazon Princess. A smiling Batgirl crows how she knew Batman would save her because he must love her, while Wonder Woman explains that with of all their justice league adventures together, the cumulative effect has suddenly made her realise her true feelings towards Batman! Flattered, the Caped Crusader tells the Amazon Princess that they would make an incongruous pair and that they both have too much on their minds. Batgirl agrees and says that an Amazon is incompatible with a normal human whereas she is not! They are two of a kind! 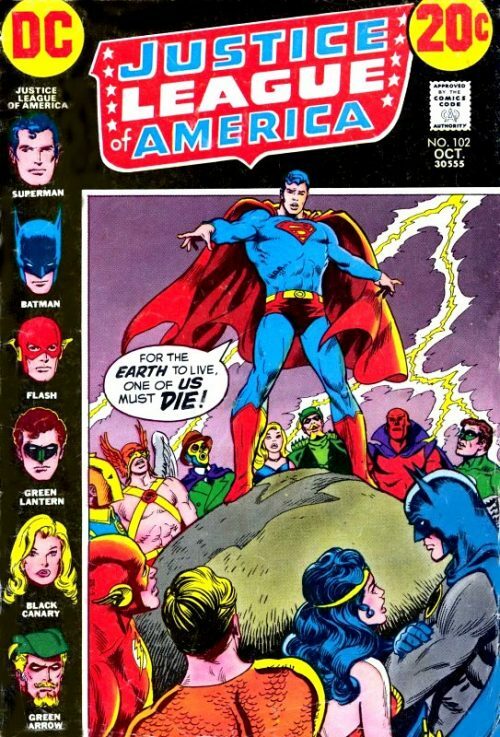 Back on the ground now and surrounded by onlookers and newspaper reporters, the squabbling super heroines decide to hold a contest to show who loves Batman the most. Batman tries to tell them the idea is crazy but the public love the idea! Reluctantly the Caped Crusader is forced to go along with it. The next day the unique competition begins and Wonder Woman starts by presenting him with treasures from Paradise Island which only a female as rare as she can obtain. For her part, Batgirl gets him a brand new Batmobile in shocking pink! As TV coverage of the contest is beamed across the city, Copperhead watches intrigued. It certainly appears that Wonder Woman and Batgirl have formed an eternal triangle with Batman. But perhaps it is all a trick? Either way he must find out! The days pass and all of Gotham gapes at the contest between Wonder Woman and Batgirl as they present Batman with ever more outlandish gifts to win his love. Copperhead continues to watch from afar, still weighing up whether this is all some clever ruse. Batgirl next gives her “lover” a new cape while Wonder Woman fashions a statue of the Caped Crusader out of gold. The two women eye each others gifts disapprovingly and then race off to out-do the other again. Batman is left to admire his new statue and feel the cut of his new cape. Commissioner Gordon tells him to pull himself together as it appears Batman is beginning to enjoy the adulation being heaped upon him! Gordon orders him to remove the gold statue from the park and begrudgingly Batman uses his batcopter to carry it away. Nearby, a disguised Copperhead watches him depart and muses this new turn of events. Batman appears to be responding to the super heroines’ affections but this too could all be part of some plan. He decides to test Batman. A short while later Wonder Woman and Batgirl present Batman with exactly the same gifts! As they squabble about who had had the idea first, one of Copperhead’s henchmen is attempting to break into a building nearby, just as he has been instructed to do by his boss. Down on the street, Batman is trying to hold back Wonder Woman and Batgirl as they go for each other when suddenly they hear a burglar alarm go off. Up above, the scared burglar makes his escape, assuming the Batman will be upon him before he knows it – but the Caped Crusader is still distracted by the fighting super heroines! However, the unlucky burglar runs straight into Commissioner Gordon and his officers! As the burglar is taken into custody, an irate Gordon tells Batman that he should have been concentrating on capturing the felon instead of consoling his girlfriends! Batman explains that he cannot guard Gotham while he is having to deal with Wonder Woman and Batgirl. Not far away Copperhead is listening in on the conversation and is pleased that his test has been passed. Batman had done nothing to catch a crook under his very nose! This contest for Batman’s affection must be for real! Which leaves things clear for Copperhead to take his biggest prize! Later that night Copperhead breaks into the Gotham Museum and heads towards the display case containing the Golden Casque of Montezuma. 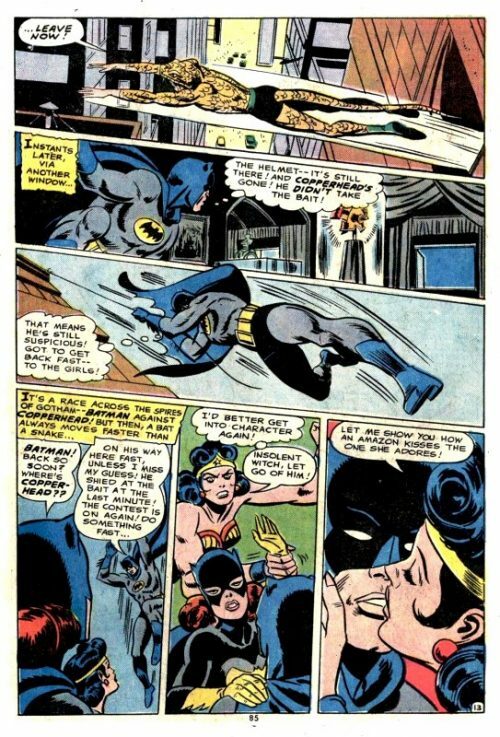 As he breaks the security eye-beams the alarm in Batman’s utility belt is activated and immediately Batman tells Wonder Woman and Batgirl that the show is over. Their ruse has lured Copperhead into thinking Batman is too pre-occupied with the super heroines’ love rivalry and has taken the bait! Quickly he heads towards the museum! Meanwhile, Copperhead is about to break the casket when his serpent’s seventh sense warns him to stop. He swiftly makes his escape and moments later, Batman arrives to find the Golden Casque of Montezuma is still there but his quarry has gone! The Caped Crusader guesses that Copperhead is still suspicious and he realises he must get back to the super heroines quickly before Copperhead does! He uses his Bat rope to swing across the city’s streets as fast as he can and arriving in time, warns Wonder Woman and Batgirl that Copperhead is coming and that their “contest” is back on! Quickly getting back into character, Wonder Woman pushes Batgirl out of the way and plants a romantic kiss on Batman’s lips! Not far away in an alleyway, Copperhead has arrived and watches these events puzzled. His serpent sense is never usually wrong but it seems that Batman is still here with the two “loved up” super heroines. He decides to return to the museum and this time definitely steal the Golden Casque of Montezuma! A few minutes later Batman hears the alarm go off in his utility belt again and he tells the heroines that it is time for him to go back after Copperhead. But instead of ceasing their ruse, Wonder Woman and Batgirl continue to declare their undying love. As the confused Batman tries to set off to the museum they grab him, holding him back and squabbling over his affections. He realises that this time they are not faking! Back at the museum Copperhead grabs the Golden Casque of Montezuma and makes his getaway as Police try unsuccessfully to stop him. “Where is Batman?” the officers ask? Across town, the trapped Batman is still trying to shake off Wonder Woman and Batgirl and he thinks to himself that he can just imagine what Gordon will say! “You failed me, yourself and the city of Gotham, Batman!”. He knows his reputation will be ruined if he does not capture Copperhead – and fast! At last he finally manages to throw off the love struck women and makes his getaway. He muses that this whole thing had been his idea but he still has one emergency gambit to play! Copperhead does not know that the Golden Casque of Montezuma has a homing device hidden inside! He can follow it to Copperhead’s lair! The signal zig zags across the city as Batman tries to keep up with it. Suddenly though he finds Wonder Woman blocking his way and she tells him that she has hidden something in the park – something she has never dared reveal to any man – a poem disclosing her secret identity! Batgirl then appears behind him and says that she too has revealed her secret identity and hidden it in the same place. She offers to lead him to where it is hidden but Wonder Woman leaps at her and Batgirl only narrowly manages to avoid her punch! The Amazon Princess snarls that she does not need Batgirl’s interference and can tell Batman herself that the identities are hidden in the bucket of the Wishing Well in Gotham City Park. Suddenly Batman notices another of Copperhead’s listening devices which seem to be planted across the city. He realises that the villain has overheard everything and now knows the location of Batgirl’s and Wonder Woman’s secret identities! The Caped Crusader tells the super heroines. 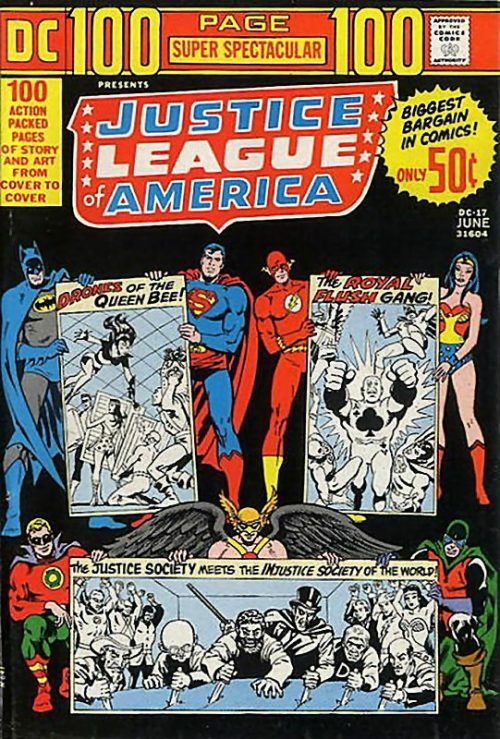 what has happened and the threat to the most precious thing each possess acts like shock treatment, snapping Wonder Woman and Batgirl out of their infatuations. 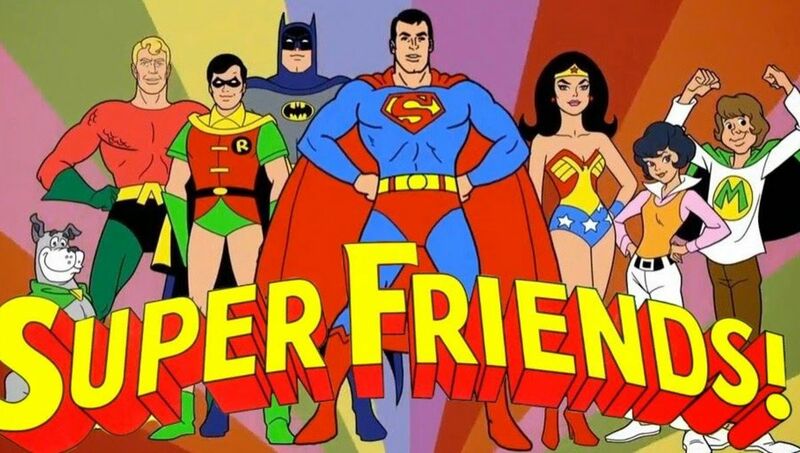 A relieved Batman tells Wonder Woman that as she is the fastest, she should go to the park and destroy the evidence before Copperhead grabs it! A few moments later Wonder Woman arrives at the Wishing Well to find that Copperhead has already removed the two pieces of paper! As he crows in triumph she grabs them from the startled villain before he has a chance to read them and clanging her bracelets together, causes a spark that sets fire to the paper, destroying the secret identities for good! During the distraction however, Copperhead makes good his escape and she decides to follow him into the nearby swamp. Not far away Copperhead slithers down a stream, heading towards his hideout as quickly as possible and hoping his snake like movements are too swift and silent for her to trace. But gliding through the air, the Amazing Amazon spots the wake he makes and swoops down towards him! Copperhead dives under the water and Wonder Woman plummets in after him. She watches him swim into an underwater cavern and she follows him inside. Copperhead clambers out of the water inside the cavern, assuming he is safe but is shocked to see Wonder Woman right behind him! As she advances towards him, saying it is over, she passes two ornamental snake heads carved into the rock. 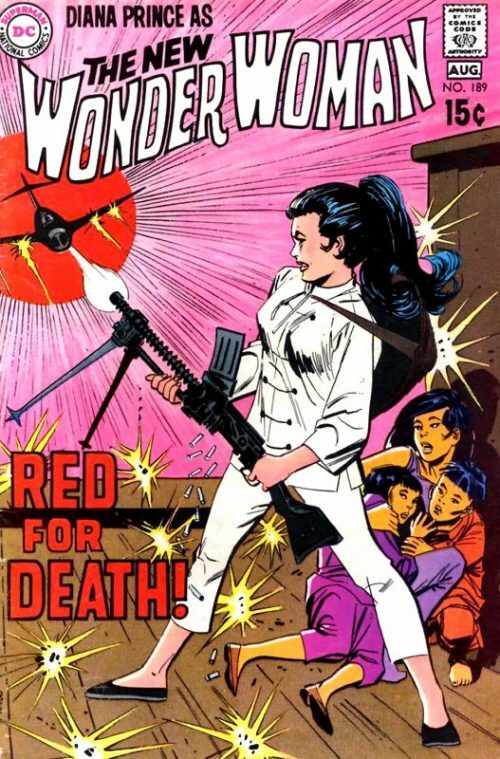 They suddenly spew out poison gas and choking, Wonder Woman collapses as the effects of the deadly toxin overcome her! Copperhead checks her body and is amazed to find she is still alive. However, he is confident that nobody will be coming for her or the stolen Golden Casque of Montezuma! Elsewhere Batman and Batgirl are using a boat to navigate the swamp, still following the homing device signal. The signal has faded however and there is still no sign of either Copperhead or Wonder Woman! Batgirl shivers and asks to get off the boat onto a nearby rock outcrop. Batman allows her to, but is surprised to find the female crime fighter spooked so easily. Batgirl however is merely grabbing a chance to bag Copperhead on her own by using her female intuition! She clambers down through the rock formation and finds herself inside Copperheads lair! 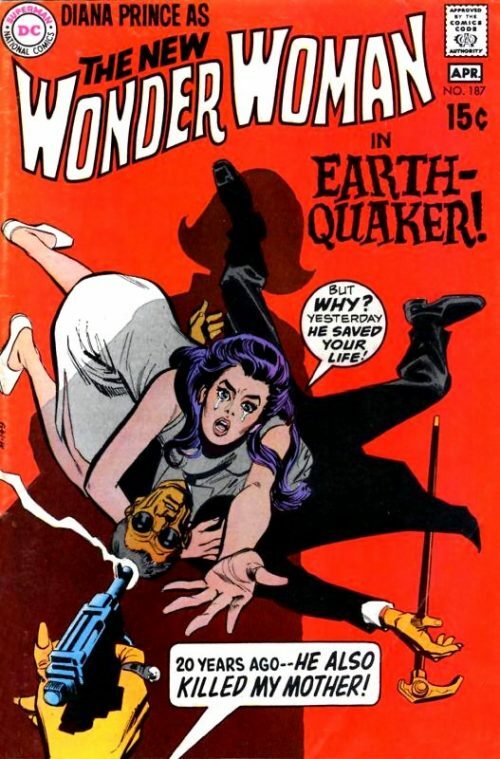 She confronts the surprised villain as he drags Wonder Woman’s unconscious body across the floor. Batgirl throws a lead weighted missile at Copperhead, apparently knocking him out. Smiling, she thinks to herself how surprised Batman will be to see her deliver Copperhead and the Golden Casque of Montezuma to him. However, as she goes to check on Wonder Woman’s condition she is felled by a kick from Copperhead, who has been playing possum! Meanwhile above, Batman has scoured the entire swamp and is now swimming towards the underwater entrance to the cavern. He realises that this is where Batgirl had disembarked and that she must have found the villain’s lair and maybe had even captured him! As he enters the cavern though he sees the two heroines’ bodies lying there and fears the worst. 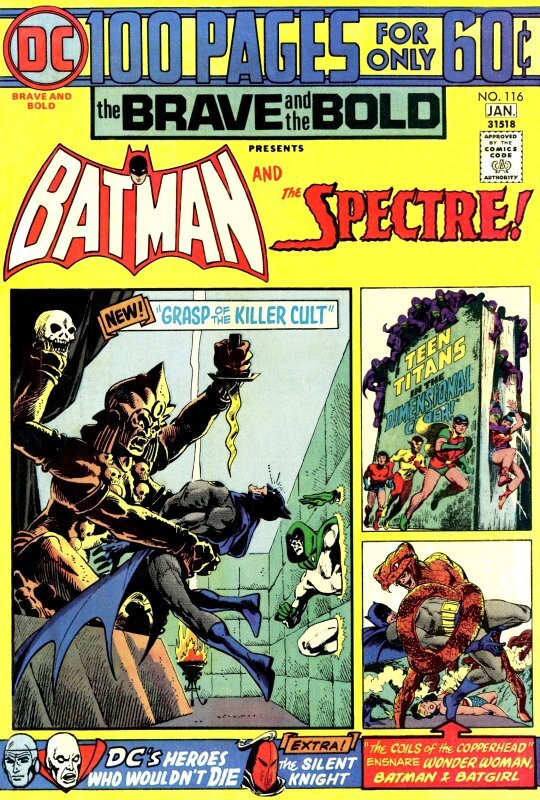 He lunges at Copperhead in anger and the villain uses his fangs to bite the Caped Crusader! Batman staggers backwards in pain as the toxin courses through his body! 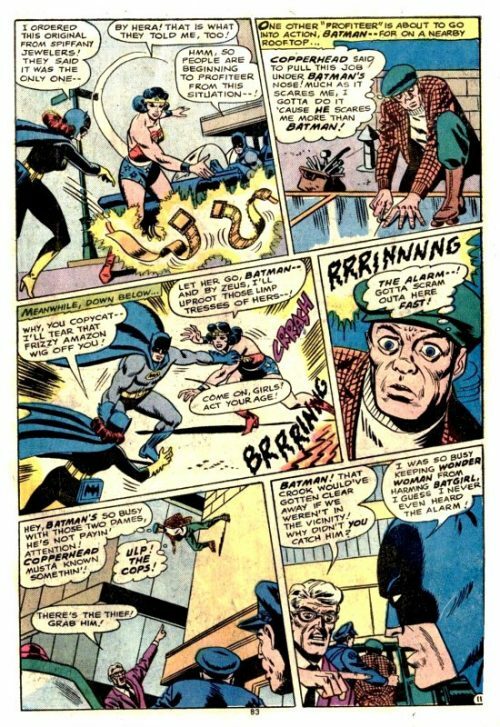 The gloating Copperhead tells him that he only has minutes to live and Batman responds by punching the villain, saying that in that case he had better finish the villain fast! Batman uses all his strength to pummel the foe to the ground before using his bat rope to bind the villain. Weakened, he then staggers and falls to the ground as the laughing Copperhead tells him that his efforts have been wasted and he is about to die! Copperhead has seemingly triumphed over Wonder Woman, Batgirl and Batman! Just then though Batgirl comes to and seeing Batman’s condition, grabs a phial of anti-venom serum from her utility bag, which she had thought to bring with her as she knew they would be tangling with a viper such as Copperhead. She quickly administers the life-saving serum and is relieved to see the colour return to Batman’s face. 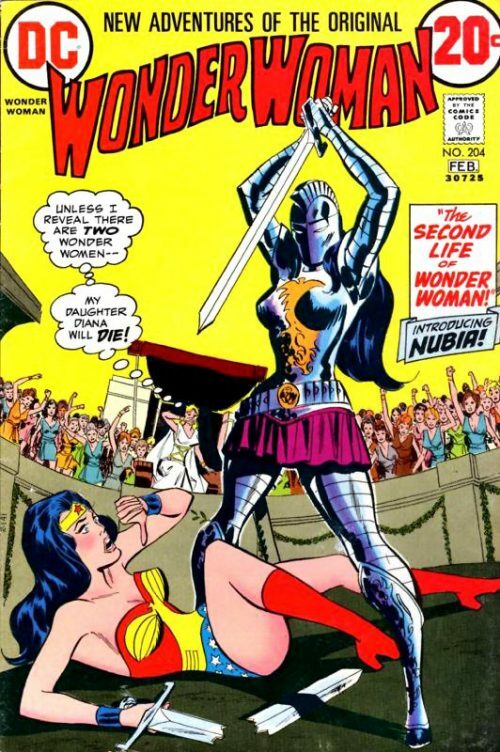 Just then Wonder Woman comes to and Batgirl is similarly relieved to see that the Amazon Princess is still alive. Wonder Woman stares down at the still weakened Batman lying in Batgirl’s arms and fears the worst, but she is assured the Caped Crusader will recover. Soon Batman is strong enough to get up and holding the Golden Casque of Montezuma, tells the bound Copperhead that he is going to jail. The furious Copperhead replies that Batman had only succeeded in capturing him because of the two “she-devils” beside him! Batman smiles and replies “Don’t I know it!”. A short while later back in Gotham City, Wonder Woman and Batgirl bid farewell to Batman. They tell him that they hope they had both made up for having really fallen for him and that they will both be there if he ever needs them again. Batman waves them goodbye and smiling, replies “I’ll call you girls…don’t you call me!”.